Solstice Apartments, located in the northwest area of Las Vegas, NV, offers studio and one bedroom floor plans to choose from when selecting your new home. Each apartment includes air conditioning, window coverings, kitchen with modern appliance package and breakfast bar. Some select units will have a built-in microwave. Our furnished studio comes with a Murphy bed and a full size bathroom. Cable/digital TV is available. 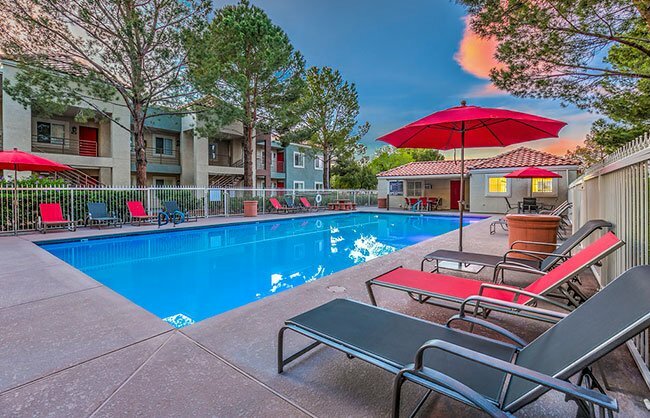 The community amenities feature a relaxing, sparkling swimming pool, BBQ and picnic area, 24-hour laundry facilities, and covered parking. We are a pet friendly community with a pet exercise park.